I have designed and installed many different solar electricity systems. Each situation is different and all were tailored to suit the locality, type of dwelling and budget of the customer. This is the control panel installed inside the hut. It contains a solar controller to monitor and charge the battery, and provides a digital voltage readout. 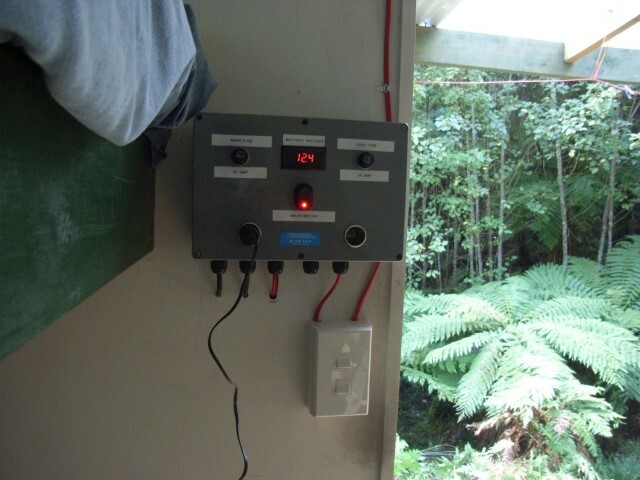 We installed two deep cycle batteries in parallel, a single 12v panel on the roof and LED strip lighting inside the hut. Solar panels are brilliant, have zero moving parts and last for 40+ years !! The price of electric solar panels now is 1% of what it was in the 1970's. With the insane cost of houses in New Zealand more and more people are looking for alternatives. Tiny houses are a very clever and Zen solution to unafordable housing. I have installed solar electric systems for half a dozen tiny houses, and get new requests all the time. The very first thing to do is to look around and "see" what resources you have. For the system to be designed well, it needs to fit your needs but it also draws from it's surroundings, and make the best use of what is available. So while most sites get good sun, what else is available ?? I worked on a tiny house that had acess to 240v power, but it was at the far end of a boat yard and the electric system was a nightmare. Extension cables lying on the ground, plugged into 4 way boards and running off in all directions, only to go into more 4 way boards and again run off into the grass, under boats and into caravans !! So whilst he had acess to power, he couldn't draw much from it, much less rely on it. 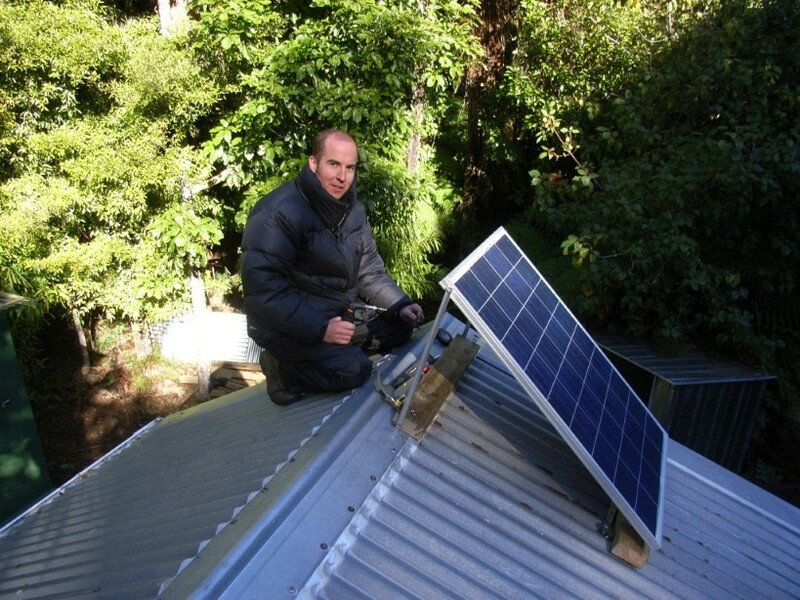 Pete also had a 12v to 240v inverter for charging his laptop and running kitchen apliances. Now instead of solar panels and a solar controller, we used a high quality battery charger that nibbled away at the power available, without stressing their electricity system. This cost $200 instead of $1500. This is just one example of how to look around, see what is available and try to design your tiny house electricy system to best fit what resources you have. It's also an example of my approach to design. It's commonly thought that 12v batteries are always 12volts. Their voltage actually changes all the time, from up to 15v during the charge cycle, to 12.25v at 50% discharged. How can this be ?? Well they are a chemical storage of electrical energy, and thus are rather complex. 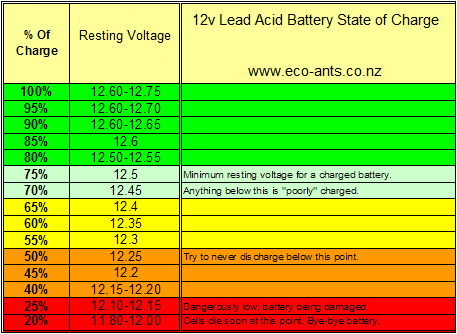 The above table shows how the voltage changes with the amount of charge remaining in the battery. Battery life is directly related to how deep the battery is discharged, and how often. If a battery is always discharged 50%, it will last about twice as long as a battery always discharged 80%. If only discharged 10%, it will last about 5 times as long as one discharged to 50%. Deep cycle batteries are designed to be discharged as much as 80% time after time, however the best lifespan vs cost method is to keep the average discharge cycle less than 50% discharge. Discharging them more than 80% hurts them and severely reduces their life.